St Eadburgh's Church, Broadway, Worcs. Nottinghamshire is not well known for its saints. There appear to be unlike Lincolnshire, Yorkshire or Derbyshire any local saints. However, Nottinghamshire did once claim the shrine of a little known saint, Eadburgh. How long this shrine survived or in what form it existed is unclear. No record suggests or records it and it is probable that the shrine did not survive the Norman reconstruction of the church to create the magnificent edifice we see today. It has been suggested that rather than Paulinus, a much better known saint, who is attributed to the foundation of the minster, it was Eadburh. 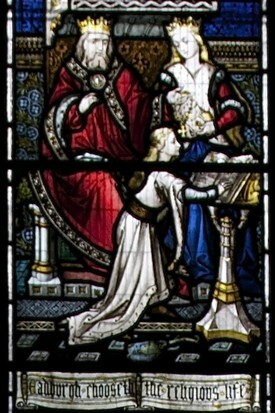 It is known that she inherited the position of Abbess of Repton after the death of Elfrida and may have been involved in the foundation of a community in Croyland. The saint is mentioned in the Life of St. Guthlac, the saint who hermitage was the foundation of this said establishment. There is no record of whether she had any role in the establishment of Southwell, which is generally assigned to the mid-tenth century on the basis of a 956 charter granting it and dependent villages to the Archbishop of York. However it would appear unlikely that the only shrine of the first church would be a person not associated with its formative years. This page was added by R B Parish on 14/03/2013.